while I can say that 1963 followed a great year for marvel comics. there can be no doubt that, it itself would also be a great year, and in fact surpassing 1962.
where last year offered us many of the great hero’s marvel had to offer in 1963 we seen Spider-man get his own title, as well as the debut of Iron Man in Tales of Suspense. Then marvel brought us Sgt. 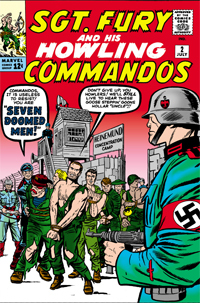 Fury and his howling Commandos. and then if this was not enough, before year’s end marvel would bring us two of its greatest teams ever, The Avengers and The X-Men. Now without many more words, a list of the comics that have a cover date from 1961 that have been reviewed on this site.